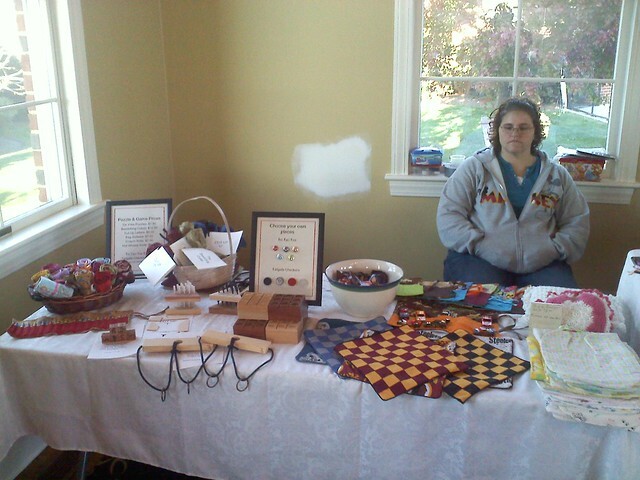 Yesterday we sold at our first craft fair. It was a rather nice day and the venue was small, the local HOA puts it on each year at the community center. Our focus was primarily Puzzles and Games. We have shopped a number of the local shows the past few years and noticed it was a bit lacking in this area so we figured it would be a good area to focus on. DW did a number of sewn games and also toy holders, the matchbox holders were a huge hit. While I focused in on the wooden games and puzzles, most of which you have seen in my past blogs over the past few weeks. It was a slow start but business picked up and we walked away pretty happy and are putting serious consideration into doing this show and maybe a few other local ones next fall. We want to make sure that we take our time to build inventory over the upcoming months so we are not rushing around like we did on this one. We only made about 6 or so of each item, which turned out to be a good number for this show, but would like to have a number in reserve just in case. Our table space was shared with my mother who also brought sewn and crocheted items. Some of which sold ok. We will be working on ideas for table set up in the future and trying some ideas out. This is the table we had, one of our key things is that everything is portable as far as the items are concerned. The idea to let folks choose their own markers for the Tic-Tac-Toes was a pretty good one. We certainly did not have a lot of competition as there were only two other woodworkers there both offering lathe turned items; some very nice stuff. No one was offering the games and toys. I know a few of you also had craft fairs and shows this weekend hope they all went well. I am looking forward to cleaning up my shop this week and getting some things in order before I tackle a larger project. My office suite is still lacking credenza, so I am looking forward to working on that and finally finishing up my office. I mean it has only been like 2 1/2 years. Hope everyone has a good week in and out of the shop. Glad you had a great time and sold well. Sounds like you had a good start to things. I used to do shows when I did needle work crafts and I always enjoyed meeting people and you are right it is a little weird to think that someone you don’t know is going to be using something you made. But it’s a good weird feeling that you’ll get used to. Congrats on a good start. I know what you mean about trying to get it all done on time. The nice thing after doing a few of them is that there are always some left overs to take to the next one. So you only have to make a few more things each time. Good luck! I’m glad yo0u had good show. I’m going to do a show this saturday on the 12th. Never done this show before. If it turns out like your show did, I will probably get 2 booth next year.